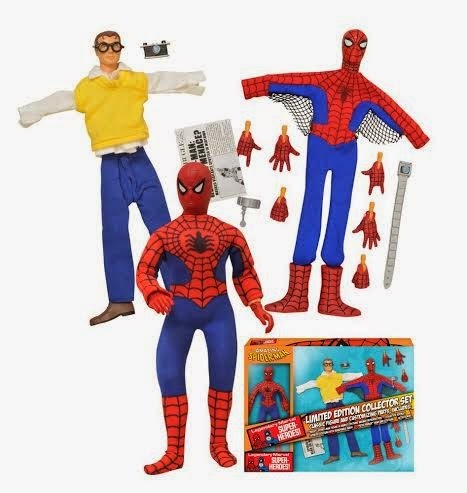 Painstakingly designed by the craftsmen at EMCE Toys, the Amazing Spider- Man will come as he first appeared in 1973, in his original "circle suit" costume. 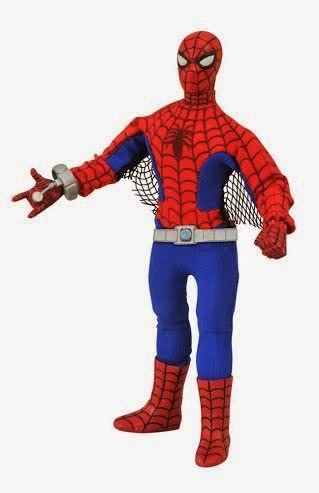 However, the head and costume will be removable, allowing you to use the additional heads, hands, outfits and accessories in the set to turn him into Daily Bugle photographer Peter Parker, or a more modern comic version of the wall-crawler! "Getting the opportunity to make the Marvel toys inspired by my childhood has long been a goal of mine, and kicking the line off with my favorite Marvel hero, Spider-Man, was a no-brainer," said DST director Chuck Terceira. "Offering extra parts and new outfits allow us to stay true to what made the toys great in the first place, while simultaneously updating the figures and making each one into a true collector's item." Future figures in the line will include Captain America, Iron Man and Wolverine, and each will come with alternate outfits and parts. Each set will be limited to just 3,000 pieces, and retail for approximately $80. Pre-orders are open for Spider-Man now, and he will be on store shelves in late 2014.